Harith al Nadhari recorded an audio eulogy for Mohammed al Zahawi, the leader of Ansar al Sharia Libya, shortly before his own death. Nadhari’s audio recording, which was released via Twitter on Feb. 6, has been translated by the SITE Intelligence Group. Like other Ansar al Sharia leaders in Egypt, Libya and Tunisia, Zahawi had an al Qaeda pedigree. In Yemen, Ansar al Sharia is merely a front for AQAP. Zahawi’s meeting with bin Laden in the 1990s is a strong indication that he had long operated within al Qaeda’s network. His dossier since then buttresses the point. Nadhari also offered a call for jihadist unity in Libya, saying that the mission was not completed when Qaddafi fell. Some of Nadhari’s audio message appears to implicitly address the infighting between the Islamic State’s supporters in Libya and the jihadists in Ansar al Sharia and other groups who refuse to swear allegiance to Abu Bakr al Baghdadi. AQAP is not the only official branch of al Qaeda to mourn Zahawi. 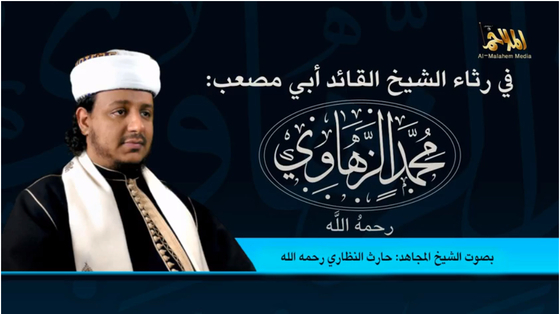 Al Qaeda in the Islamic Maghreb (AQIM) issued its own eulogy for the deceased Ansar al Sharia Libya leader online. In the aftermath of the Sept. 11, 2012 terrorist attack in Benghazi, Libya, a popular meme held that Ansar al Sharia was just a “local” jihadist group and was not part of al Qaeda’s international network. Abundant evidence at the time indicated that this was false. For instance, a report published in August 2012 by the Library of Congress and the Defense Department’s Combating Terrorism Technical Support Office (CTTSO), “Al Qaeda in Libya: A Profile,” connected Ansar al Sharia to al Qaeda’s clandestine network inside Libya. The report’s authors pointed out that one prominent Ansar al Sharia leader in Derna, Sufian Ben Qumu, is an ex-Guantanamo detainee who served as an al Qaeda operative before his detention by US forces. Other facts demonstrated Ansar al Sharia’s ties to al Qaeda as well. Ironically enough, the participation of Ansar al Sharia fighters in the 9/11/12 Benghazi attack was itself an indication that the group was, at a minimum, colluding with various al Qaeda branches. At least three other al Qaeda groups took part in the raid on the US Mission and Annex that night. Jihadists from both AQAP and AQIM were involved in the assault, as were members of the so-called Muhammad Jamal Network (MJN). AQAP and AQIM are formal branches of al Qaeda, while the MJN was led by an Egyptian who was first trained by al Qaeda in the late 1980s and had long been a subordinate to Ayman al Zawahiri. Ansar al Sharia’s role in al Qaeda’s global network was eventually recognized by the United Nations’s Security Council, which added the group to its al Qaeda sanctions list in November 2014. The UN did not directly sanction Zahawi, but did identify him as Ansar al Sharia’s leader in Benghazi. The UN also noted that Ansar al Sharia in Benghazi works closely with AQIM and Al Mourabitoun, an AQIM offshoot that remains loyal to Ayman al Zawahiri. Is it odd that al qaeda wanted the Qaddafi regime toppled, and barack hussein obama obliged them?